Twitter is just one of many social media platforms out there and can be the most difficult to see the immediate value it can provide you. Twitter is different to other social media platforms in that it encourages quick, frequent conversations between its users in the form of ‘tweets’ or posts. As one of the fastest paced social media platforms, Twitter can be one of the hardest to “get right”. 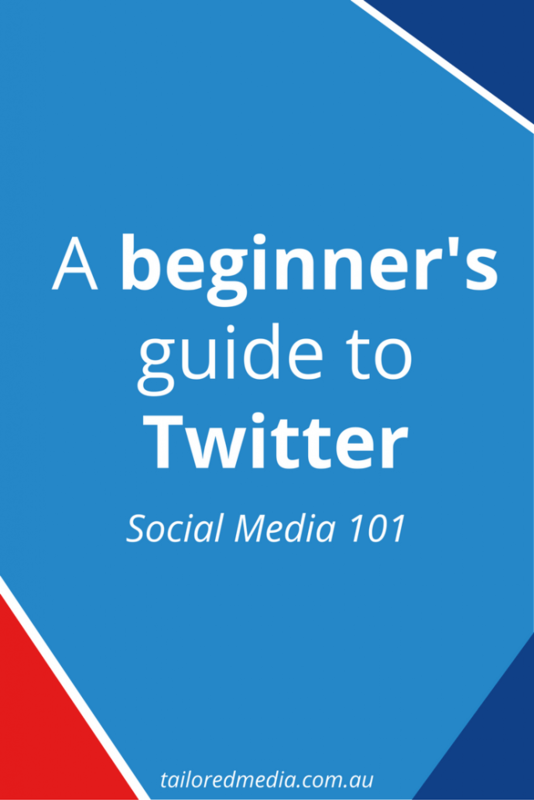 What do I need to know before getting started on Twitter? Unlike Facebook, you do not need to create a separate ‘Page’ for your business using your private account. To get your business on Twitter, all you need to do is create a new account. You can do this by following the prompts on the Twitter home page. Once you log in, you will be directed to your Timeline. Your Timeline is a collection of all of the posts from the people you follow on Twitter. By default, these tweets are sorted by what Twitter believes you will care about most. You can change your settings so that your timeline displays tweets in chronological order if you feel the need. Your profile page is where everything you tweet, retweet or reply to is displayed. A list of everything the people you follow have posted. A page that summarises some of the most recent highest trending topics and newsworthy stories. A page that records all interactions you have received from other users. If you get a retweet, like or someone mentions your name, you will receive a notification here. This is your Direct Message (DM) inbox. All private messages that you send or receive are stored here. A Tweet is a post that you make to Twitter. Twitter limits the length of your tweets to 140 characters which is part of what makes Twitter so appealing – what you have to say has to be said fast. You also have the option to attach photos, videos, gifs and polls to your tweets. A Retweet is when someone copies your Tweet and re-posts it on their own Twitter account. Each Tweet can easily be Retweeted using this button which is found at the bottom of a tweet. A Like is basically you acknowledging that you have seen someone’s post and that you think it’s pretty good. To Like something, you just need to click the little heart button below a Tweet. This is where you post to Twitter. The first button is located at the top of the screen on every page while the ‘What’s happening?’ box is located only on your Home page. From here you can post a Tweet and attach a photo or video. Unlike Facebook, anything you Tweet is immediately shared with the whole world. Do not post anything you wouldn’t want a stranger to know about your life or your business and with everything on the internet, remember that anything you post on the internet is there forever and there is a high possibility one of your clients will see it. Technically, anyone can see your Tweets as Twitter profiles are public by default, however, getting your tweets in front of other people when you are just starting out can be difficult unless someone is following you, you have used a hashtag, or your Tweet is a direct response to someone else’s Tweet. Imagine Twitter is a BIG filing cabinet and in that filing cabinet is a huge stack of folders labelled “Public relations”, “Social Media”, “Marketing” and “Branding”, etc. If this tweet was a document, it would get filed in the social media folder so that if someone was looking for information about social media, they could find it quickly and easily. Hashtags can be created using any word or topic you want. All you need to do is add a pound sign (#) before the word. For strings of words, you will need to remove any spaces. 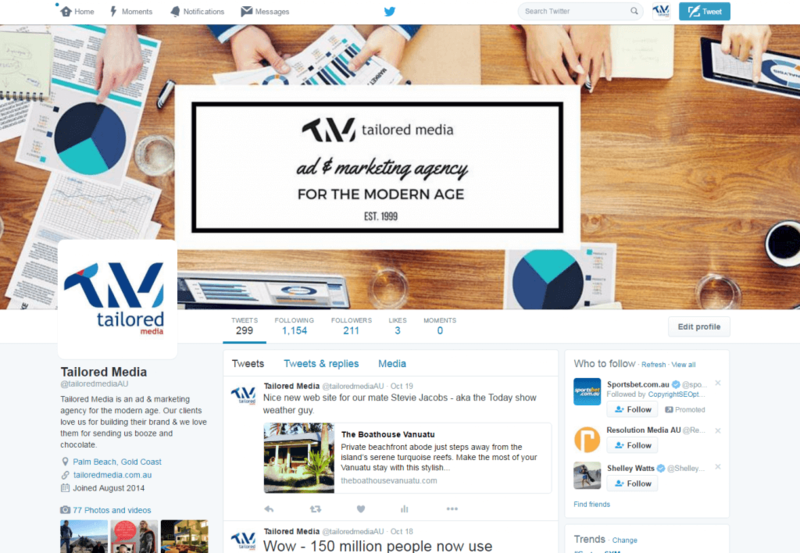 For example, Tailored Media would become #TailoredMedia. Twitter trends are the most tweeted about topics or hashtags at that time. These change regularly and you have the option to choose worldwide trends or country specific trends. It can be great for exposure to jump in on the conversation under a trending topic IF it is relevant to your brand. How do I talk to someone over Twitter? There are two ways: Publicly and Privately. Private messages are sent and received using the Direct Messaging inbox. You can then send private messages to people who follow you as you would with private Facebook messages or even emails. To publicly talk to someone or a brand, you can send them a tweet by including their username in a Tweet. To do this, add an @ symbol before you begin to type in their username. So if you were to mention Tailored Media, you would type @tailoredmediaau and we would receive a notification that we are being talked about. What’s with the fullstops on Twitter? Seems a bit odd to start a sentence with the end of a sentence, I know. So why would you do it? If you start a tweet with an “@” mention, your tweet will not show up on your main Twitter profile. Instead, it will be sorted into your replies tab (which you can find on your profile page). So, if you want a tweet that begins with a mention to appear on your main page, adding that little stop at the beginning will do the trick. Should I be using Twitter for my business? It depends. Twitter can be extremely powerful for business and there are a number of businesses who are using it very successfully, however, it can be an extremely labour intensive social media platform. Twitter moves very quickly, trends are changing all the time and the 140 character restriction on posts mean that interactions must be extremely efficient. There is also a lot of “noise” out there (like a big flock of birds tweeting to each other). The short Tweet lengths mean that the sheer volume of Tweets is much higher so your posts will very quickly get pushed down the list. To get a lot out of Twitter, you need to be able to invest the time to build relationships with your followers and customers. Simply posting links to articles you have written or new products you have created is not enough to really see benefits from Twitter. 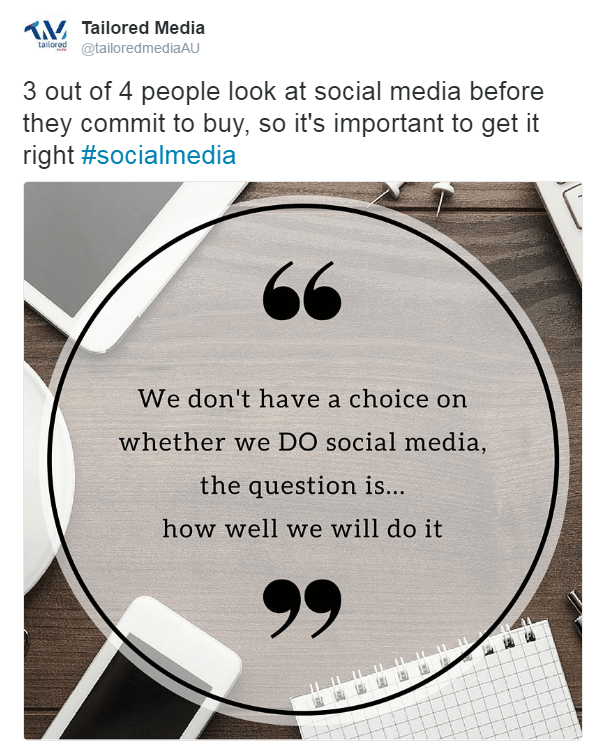 You need to be engaging in conversations and responding to your mentions and this is why a lot of businesses will outsource their social media. 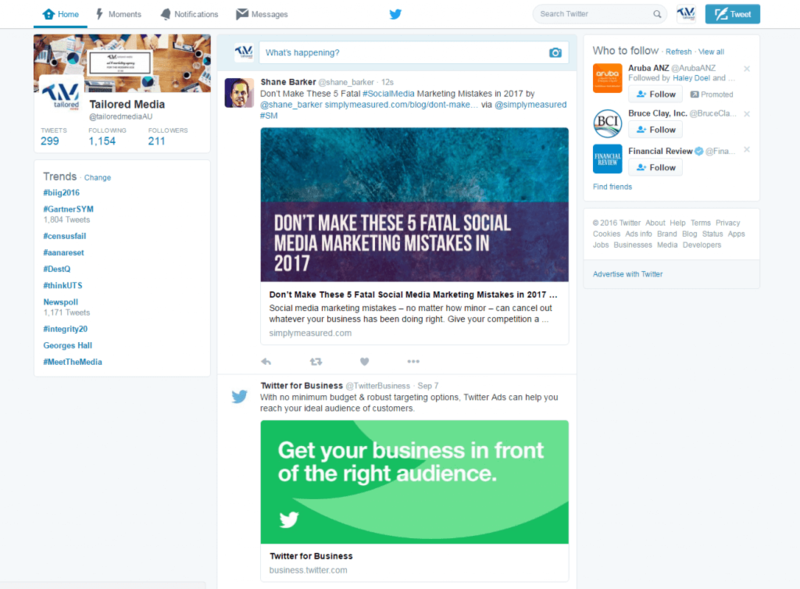 If done correctly, Twitter can be extremely useful for businesses. 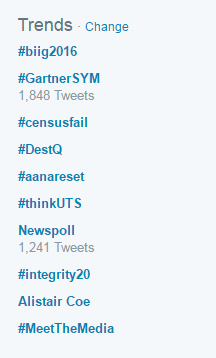 The hashtag system makes it very easy to look through what people are talking about in your niche. This allows you to respond to their Tweets with valuable advice or contribute to conversations. In our first post we talked about how social media doesn’t necessarily generate leads, but creates social proof. Twitter will allow you to do that and show you are an expert in your industry quickly and effectively. Twitter can also help to break down the walls separating you and your customers as the level of interaction tends to be significantly more personal than say, Facebook. What do I post to my Twitter business page? Keeping in mind that the purpose of Twitter is to create social proof, you should share quality information that positions you as an expert in your field. The most effective way to post to your business page is to develop a strategy and have a think about your brand voice. Once you have started generating your own content, you should begin engaging with other users. It is nearly impossible to “break into” Twitter without creating conversations. Some of the most successful Twitter campaigns I have seen are those where a person or business hosts “live chats” and “Q&As”. So far we have covered how to use Facebook and Twitter but this is only the beginning when it comes to social media. Next week we will be covering one of my favourite social media platforms – Instagram – and make sure you stay tuned in the coming weeks for more posts in the Social Media 101 series!